The oldest Walsh children — B. Maria, James George, Henry, Mary Ann, and Robert — were all born prior to 1852, so if they were baptized at the Cathedral of St. Catherine of Alexandria, their baptismal records would unfortunately be included in that missing batch of records dated between 1842 and 1851. However, the younger Walsh children — Elizabeth, Ellen (Nellie), Thomas, and Joseph — were all born between 1854 and 1861, within the range of dates for which baptismal records still exist for the Cathedral. There was plenty of evidence based on census records and other documents for the dates of birth of each of them, and in fact, baptismal records for Elizabeth, Thomas and Joseph, were quickly discovered in a previous round of research. Nellie, however, remained elusive. Why might that be? Like many members of the Walsh family, Nellie M. Devere and her husband, Charles Devere, had a habit of migrating back and forth between St. Catharines and Buffalo, New York. In 1900, they were found living in Buffalo, and in the census that year they reported that they immigrated to the U.S. in 1883. Nellie was reported to be 42 years old and married to her husband for 17 years, which suggests that they married just prior to their move to the U.S. Nellie was reported to have no living children, nor any children who had died prior to the census. She was born in Canada, of an Irish-born father and Canadian-born mother, consistent with established facts. Her mother, Elizabeth Welsh (sic) appears in the next line, recorded as mother-in-law to head-of-household Charles Devere. Most germane to the current question is Nellie’s date of birth, which was recorded as December 1857. When I discovered baptismal records for Nellie’s siblings, I had employed a targeted approach, starting my search a month or so before the individual’s date of birth as established from existing evidence. In the case of Nellie’s siblings, this strategy worked very well, and I was able to locate their birth records quickly, since they were accurate reporters of their own dates of birth in later years. However, Nellie was not born in December of 1857, as was stated in the 1900 census. In my first pass through the baptismal records, I searched for Nellie from December 1857 all the way up through December 1858, but did not find her. At the time, I didn’t worry too much about it, but instead skipped ahead to find baptismal records for her brothers in February 1859 and February 1861. Ellenor Margaret was born on Christmas Eve in 1856 but not baptized until August of the following year. Her date of birth was exactly one year earlier than what was reported in the 1900 census. All it took was a more thorough review of the records to find it. What a nice way to celebrate St. Patrick’s Day! 1 “Roman Catholic Diocese of Saint Catharines,” Wikipedia, https://en.wikipedia.org, accessed 19 March 2018. 2 Price, Rev. Brian, Archives of the Roman Catholic Diocese of Kingston, e-mail message to the author, July 7, 2016. 3 Sweetapple, Lori, Archives of the Roman Catholic Archdiocese of Toronto, e-mail message to the author, July 11, 2016. 4 Wilson-Zorzetto, Liz, Archives of the Roman Catholic Diocese of St. Catharines, e-mail message to the author, July 14, 2016. 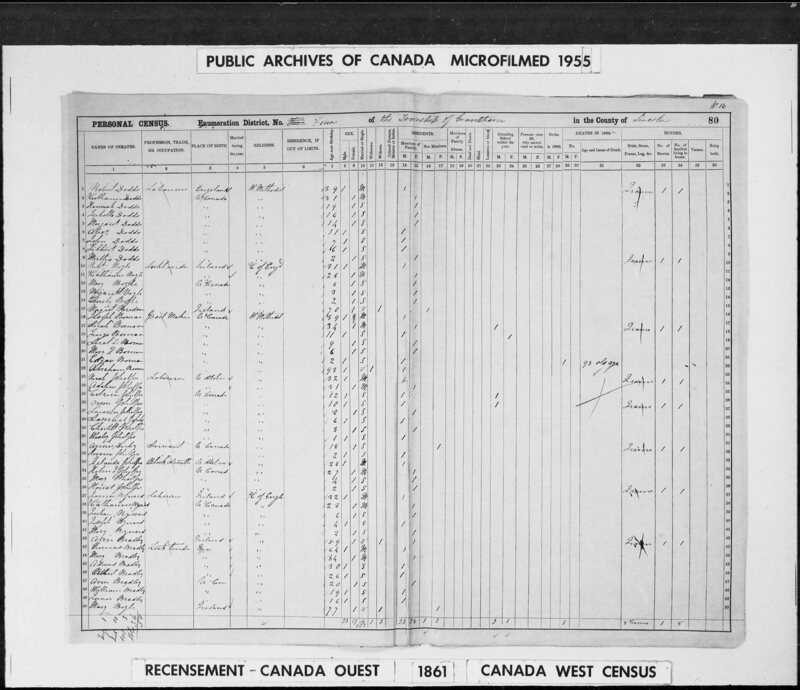 5 “Ontario Civil Registration (National Institute),” FamilySearch, https://www.familysearch.org, accessed 20 March 2018. 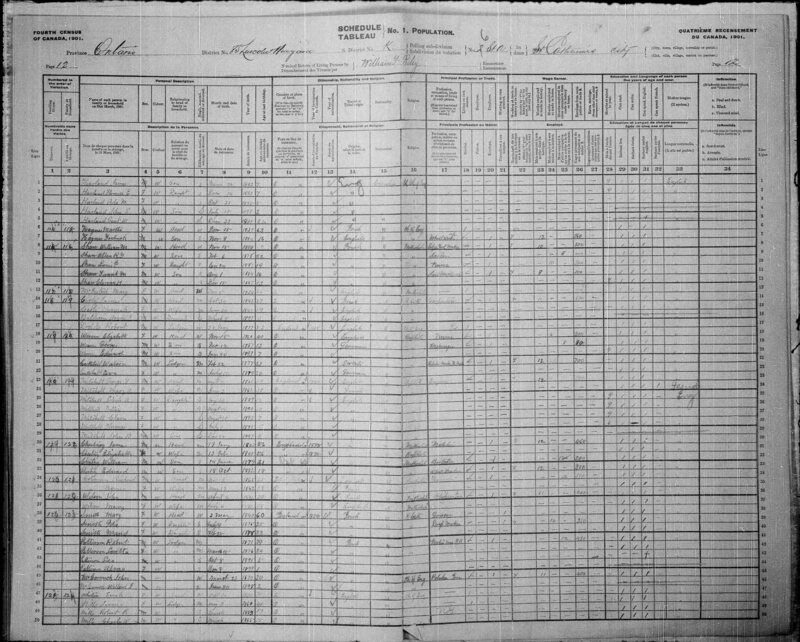 6 “United States Census, 1900,” database with images, Nellie M. Devere, line 42, FamilySearch (https://familysearch.org/ark:/61903/3:1:S3HT-DTL8-36?cc=1325221&wc=9BQG-JW1%3A1030551901%2C1033310401%2C1034132801 : 5 August 2014), New York > Erie > ED 212 Election District 7 Buffalo city Ward 24 > image 5 of 8; citing NARA microfilm publication T623 (Washington, D.C.: National Archives and Records Administration, n.d.). 7 Roman Catholic Church, Cathedral of St. Catherine of Alexandria (St. Catharines, Ontario, Canada), “Parish Registers, 1852-1910,” 1857, unnumbered pages, unnumbered entries in chronological order, “Baptism Ellenor Walsh,” accessed as “Ontario, Roman Catholic Church Records, 1760-1923,” browsable images, FamilySearch (https://www.familysearch.org: 17 March 2018), path: Lincoln County > St Catharines, > Cathedral of St Catherine of Alexandria, > Baptisms, marriages 1852-1860 . image 72 of 104. I’ve never been one of those family historians who likes to stick to researching just one family line until it’s “complete” and then start another line. For one thing, in our hobby, each answer (i.e. a person’s name) leads to two more questions (his or her parents’ names). Sometimes a new bit of data can turn up unexpectedly, which prompts me to drop the research I’d been working on and follow the new trail for a while to see where it leads. This tendency toward distraction is sometimes referred to as “genealogical ADD,” and there are plenty of internet memes which suggest that this is a good way to waste a lot of time with little to show for it in the end. However, I often find that taking a break from a line and coming back to it later helps me to see the research with fresh eyes, allowing me to make new connections in the data that I’d missed previously. I’ve discovered that the secret to making progress while jumping around in my research is to keep good research notes. I use Family Tree Maker, which currently offers options for both “person notes” and “research notes.” I use this section to keep a research journal, where I analyze my data, brainstorm hypotheses, plan my next steps, and keep track of phone calls and correspondence with archives, collaborators, churches, cemetery offices, etc. Sometimes it takes time before a reply is received, so rather than sitting by the phone with bated breath, I move on to other research tasks. The other day, something prompted me to take a look at where I’d left things with my Dodds line from St. Catharines, Ontario. Robert Dodds was one of my great-great-great-grandfathers on my Dad’s side of the family, born in England on 28 January 1817, according to the 1901 Census of Canada. He died on 16 August 1906, according to his civil death certificate, and is buried in St. Catharines in Victoria Lawn Cemetery, Section G. Unfortunately, this civil death certificate does not reveal Robert’s parents’ names, which I need to know in order to further my research. His marriage record might also mention his parents’ names, but unfortunately, that’s been difficult to locate as well. Robert married Catherine, whose maiden name has been variously reported as Irving1 or Grant.2 Most sources agree that Catherine was born in Ontario of Scottish parents, rather than having herself been born in Scotland, as suggested by the death record of her daughter (my great-great-grandmother), Martha Agnes (née Dodds) Walsh.1 Robert and Catherine probably married circa 1839-1840, since their oldest daughter, Hannah Dodds, was born 20 January 1841. However, early records for Upper Canada/Canada West are very spotty, as many did not survive, and it’s not clear exactly where Robert and Catherine married, or even in what faith. Robert Dodds reported his faith as Methodist in 1861, Church of England in 1871, Methodist in 1881, and Church of England again in 1891 and 1901. Catherine Dodds reported her faith as Methodist in 1861, Presbyterian in 1871, and she died in 1872. Rather conveniently, the Methodist and most of the Presbyterian churches in Canada merged with some other Protestant faiths in 1925 to become the United Church of Canada, so their archive is an obvious place to check for the marriage record. About 30% of the Presbyterian churches in Canada chose not to participate in this merger, and these non-concurring or continuing Presbyterian churches became the Presbyterian Church in Canada. Again, their archive is another obvious place to check. However, many congregations have retained their own records instead of sending them to the archives, so it’s important to know where the marriage took place. This brings me to the second problem, determining where they married. 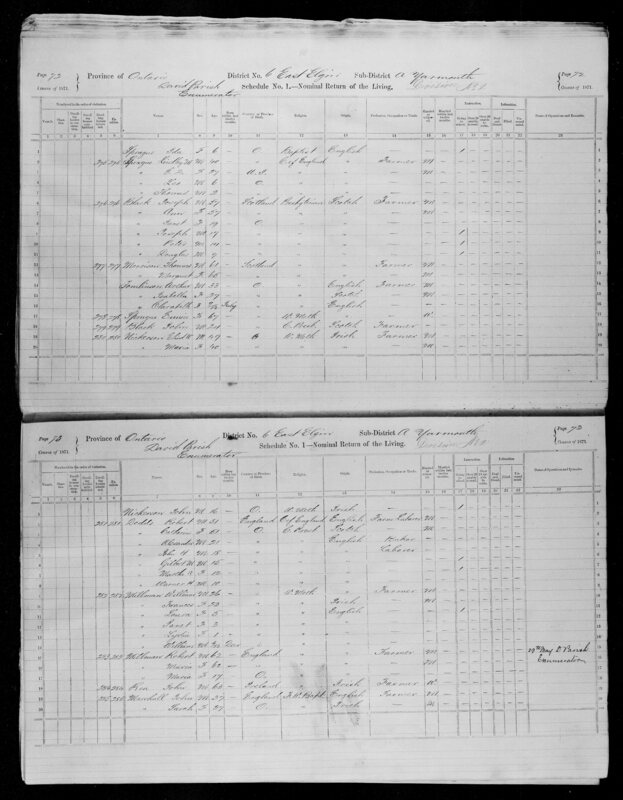 It’s common to use census records to track the movement of families and individuals, but unfortunately, the first time we see Robert and Catherine in the census is in 1861, when they are living in Grantham and are already the parents of seven children. As mentioned previously, it’s likely that Robert and Catherine were married circa 1840, so the 1842 Census for Canada West would be an obvious place to search for the young family to see if they were already in Grantham at that point, or if they were elsewhere in the province. 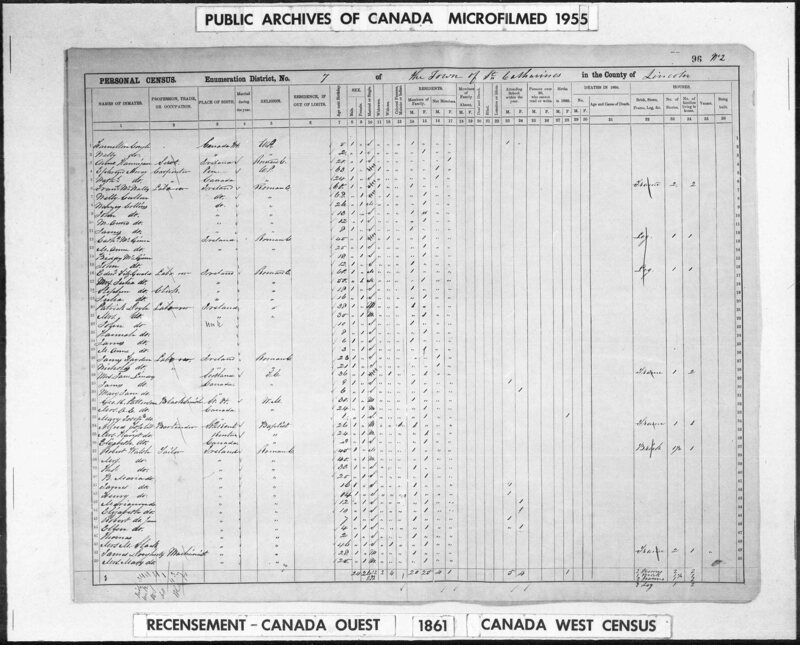 Unfortunately, most of the returns for this census did not survive, including those for Lincoln, Elgin, and Glengarry Counties, which are the three counties associated with this family based on other records. The situation is not much better with the 1851 Census. As luck would have it, and despite the fact that many returns for the Lincoln District did survive, the returns for the Township of Grantham and the City of St. Catharines did not. By 1871, the family had moved to Yarmouth Township in Elgin County, where Catherine died in 1872 and is buried in Union Cemetery. Her grave transcription reads, “DODDS / In Memory of / Catharine / wife of / Robert DODDS / died / June 12, 1872 / aged 54 yrs. 1 month & 22 days. / My children dear assemble here / A mother’s grave to see / Not long age I dwell with you / But soon you’l dwell with me.” (I find that transcription especially compelling in a morbid sort of way.) Catherine’s death certificate states that she was born in “Martin Town,” that she was Presbyterian, and that she died at the age of 53, which would suggest a birth year of 1819. Her grave marker suggests a birth date of 20 April 1818. “Martin Town” points clearly to Martintown, Glengarry County, Ontario, a place settled by immigrants from the Scottish Highlands, which is consistent with what we know of Catherine’s Scottish parentage. The original Presbyterian Church that served Martintown was St. Andrew’s in Williamstown. Marriage records for this church are indexed here for the time period from 1779 to 1914 “with a couple of gaps.”3 However, closer inspection reveals that there are no marriage records past 1815. In fact, this index seems to correspond to the collection of St. Andrew’s church records available on microfilm from the LDS, which exhibits the same gap from 1818 until 1855. And as luck would have it, that gap neatly encompasses both Catherine’s birth record, circa 1818, as well as the record of her marriage, if it took place in this parish, circa 1840. So at this point, we can’t say whether the negative result is because the record no longer exists, or because Robert and Catherine Dodds did not marry in this parish. For kicks, I checked all the indexed births, marriages and deaths for the surnames Grant and Irving, even though the particular range of years I need is not available. Interestingly, I discovered that the surname Irving does not exist anywhere in these indexed records, although the surname Grant is quite common in the parish. So where does that leave us? Well, at this point, I still don’t know where Catherine and Robert might have met and married. It might have been at St. Andrew’s in Williamstown, but if that’s the case, then the record may no longer exist. I still don’t know Catherine’s parents’ names, although the data seem to point toward Grant as a more likely candidate for her maiden name than Irving. But even in the absence of birth and marriage records, it occurred to me that I could still try to find church burial records for both Catherine and Robert, and perhaps by some miracle, these might contain their parents’ names, even though the civil death records did not. I struck out fast with Catherine’s death record. I contacted Union United Church, which is the descendant of the original Union Wesleyan Methodist Church which operates the cemetery in which Catherine was buried, to inquire about burial records. Unfortunately, I was told that they, “have no records that date that far back any longer either.”4 Robert’s church death record seemed a bit more promising, as there were a number of Anglican churches in St. Catherines by the time of his death in 1906. To help me determine which one might have his death record, I telephoned Victoria Lawn Cemetery, where he is buried. The secretary was very helpful. She informed me that Robert Dodds’ interment was handled by MacIntyre Funeral Home, and “Rev. R. Kerr” was the pastor who performed the services. A quick Google search shows that Rev. Robert Kerr (or Ker) was the rector of St. George Anglican Church in St. Catharines. A bit more digging revealed that burial records from St. George have been microfilmed and are available from the archive at McMaster University in Hamilton, Ontario. I contacted them immediately to inquire about obtaining a look-up. And that was when “real life” and other research pulled me away, and I put my Dodds line on the back burner again. I wrote that e-mail to the archivists at McMaster University back on 4 September 2014, almost two years ago. Almost immediately, I received one of those standard, “thank you for your inquiry, one of our archivists will be in touch with you shortly,” e-mails, and then nothing further. I didn’t think about it again (obviously!) until just recently. Flash forward to earlier this week, when something made me look back at my Dodds research. In reviewing my notes, I realized that I’d never received a reply from the archivist at McMaster. So I wrote to them again, mentioning my previous e-mail from September of 2014. How about that? She’d actually taken the time to review the microfilm for me, no charge! “Given the information you received from Victoria Lawn Cemetery, it really does sound like it should be St. George’s to me. I checked again, just to be certain that I hadn’t missed it somehow, but he’s definitely not there. I checked all the other churches in St. Catharines that had burial records for that time and didn’t see Robert Dodds in any of them (or records suggesting that Robert Kerr was performing services there). I’m not certain whether this means that for some reason the entry was never made or if there is some other place it might be. I have checked the vestry records for the time as well as a miscellaneous file in the hopes that there would be something, but again, came up short. While all this is unfortunate, I’m afraid that for the names of his parents, you wouldn’t be likely to get it from the burial record anyway. I know you said you were having a hard time tracking down his marriage record, but that would be more likely to have the information. Thanks for going through all of those details. I can see why you’re running out of options. Based on your information I checked a few of the other churches (namely the one in Grantham and a few that are now part of St. Catharines, but were not at the time). Frustratingly, I’ve still come up with nothing new. I was hoping I might catch a baptismal record for Hannah, at least so that we knew we were on the right track, but still nothing. I have put a call into the Archivist for the Niagara Diocese, Archdeacon Rathbone, to see if we can figure out how it is that all of that information about Robert Dodds can be recorded at the cemetery and then not show up in the burial register. He’s away today, but I’ll let you know what I come up with. So what are the take-home messages in all of this? 1. Keep good research notes. You never know when life is going to intervene and you might have to put down your research for a while. As long as you have good notes, it should be easy to pick up again when you’re ready. 2. Follow up with all your leads (even if it’s two years later). E-mails do get lost sometimes. If you don’t hear from someone for a while, don’t assume he or she was ignoring you. 3. Be sure to reach out to the librarians and archivists in the geographic areas in which you’re searching. They are a fantastic resource — typically knowledgeable about the history of the area in addition to knowing what records, maps, finding aids, and reference works are available, and where to look for them. Nothing beats local knowledge. The search may continue for my elusive Robert and Catherine Dodds, but at least it’s nice to know that I’ve got some allies in my quest. New York, Department of Health, Division of Vital Statistics, County of Erie, City of Buffalo, Death Certificates, 1935, #4549, Death Certificate for Martha Dodds Walsh. Death record for Hannah Dodds Carty, eldest daughter of Robert and Catherine Dodds (click link for details and image). Whitehead, Karen. “RE: [Cemetery] Availability of Church Records.” Message to the author from unioncemetery.uucc@gmail.com. 4 Sept. 2014. Email. Whittle, Bridget. “RE: Question submitted through Ask a Librarian chat.” Message to the author from archives@mcmaster.ca. 3 Aug. 2016. Email. Featured image: Gordon, Bruce. Photo of St. Andrews United Church Cemetery. Digital image.Find A Grave. Find A Grave, Inc., 1 Sept. 2014. Web. 4 Aug. 2016.